In recent years, in the Minneapolis area having an outdoor kitchen has become quite the trend, and it’s still on the list of top landscaping projects for 2016. And the outdoor kitchen is evolving from much more than a grill on a deck or patio. They have become more like a kitchen you’d find inside a home, only with the atmosphere of the great Minnesota outdoors. The appliances that are used in outdoor kitchens have never been so affordable, as well as being easy to install. Many families like yours are taking full advantage of these new convenient options in order to create their very own dream outdoor kitchens. Having an outdoor cooking and dining spot in your own backyard makes both family and social gatherings much more entertaining and vibrant. As an extra bonus they also will increase the value of your home. If you have been considering taking the plunge and adding an outdoor kitchen to your home, here are just a few tips that will get you started in the right direction. At the center of any outdoor kitchen is the grill. The type of grill that you select will depend on what you like to cook as well as the layout of your outdoor kitchen. If your plans include counters for food preparation, choosing a high quality built-in grill is the way to go. These grills typically come in liquid propane or natural gas and can also come with features such as warming trays and rotisseries. If you would like the look of a built-in grill, but do not want it actually built in, consider a prefab island; this type of grill creates the look of being built in without the need for construction. And because some outdoor cooks like a combination of cooking methods, some deluxe outdoor kitchens contain both charcoal and gas grills as well as wood-fired pizza ovens. A great addition to any outdoor kitchen area is a small outdoor refrigerator. It will keep all of your veggies crisp, raw meat fresh, and your drinks cold. Choose between a refrigerator cart and a built in. If you have a very tight budget you could even place an inexpensive refrigerator in a discrete but convenient place. What is the point of creating an outdoor kitchen area if it is not comfortable? Your guests will want and need a place that is comfortable in order to lounge. Invest in a quality outdoor dining set, as well as some outdoor love seats and even a couch. Don’t forget about bar stools so people can gather around the cook if you’ve got a counter area. 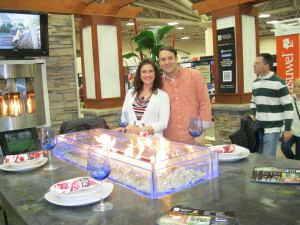 An item that is particularly ‘hot’ this year is the fire table, a dining or bar height table with a fire feature in the center. We offer a variety of manufactured units you can choose from, and we also have our own line of custom natural stone furniture that includes the Fire and Water table shown here. Adding outdoor furniture will give your area the warmth and charm that you are looking for, as well as serving as a focal point for your next gathering. This will really make the difference. If you’re ready to start designing your perfect outdoor cooking and eating space, speak with us here at Architectural Landscape Design. As a licensed MN landscape design and installation contractor, we can work with you to plan the idea outdoor kitchen while we wait for the spring time to come. In the meantime, check out these trends for outdoor kitchens before we get started on the design process.